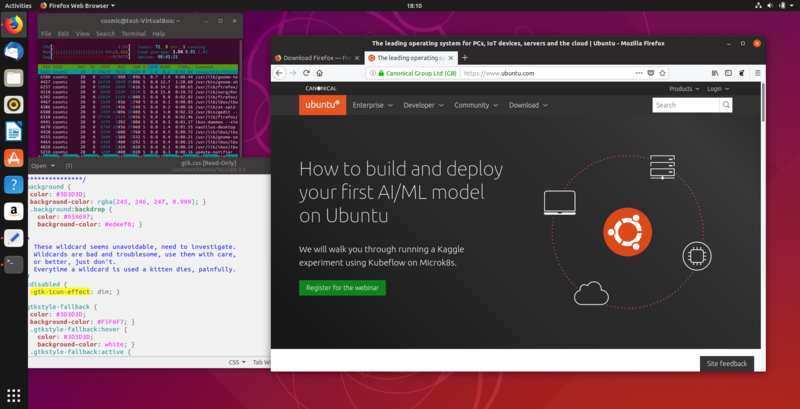 London, UK, 18th October 2018; Canonical today announced the release of Ubuntu 18.10, focused on multi-cloud deployments, AI software development, a new community desktop theme and richer snap desktop integration. This year, the financial services industry has engaged significantly with Canonical and Ubuntu for infrastructure efficiency on-premise and to accelerate their move to the cloud. The push for machine learning analytics and of fintech efforts around blockchain, distributed ledger applications and cryptocurrencies are current drivers of Ubuntu investments and deployments. Ubuntu Server 18.10 images are available on all major public clouds, including minimal images popular for container workloads with a small footprint and fast boot time. For private clouds, Ubuntu 18.10 ships with OpenStack Rocky for AI and NFV hardware acceleration and Ceph Mimic to reduce storage overhead. Ubuntu Server 18.10 includes the latest Kubernetes version 1.12 which brings increased security and scalability by automating the provisioning of clusters with transport layer encryption and is more responsive to dynamic workloads through faster scaling. Ubuntu’s secure Linux app store sports 4,100 snaps published by 1,700 developers and supported across 41 Linux distributions. Official desktop snaps from Spotify, Plex and Skype are popular, and major public cloud and server applications are now available including Google Cloud SDK, AWS CLI and Azure CLI. The new release enables native desktop controls to access files on the host system. The Linux 4.18 kernel together with updates in Mesa and X.org significantly improve game performance. Graphics support expands to AMD VegaM in the latest Intel Kabylake-G CPUs, Raspberry Pi 3 Model B, B+ and Qualcomm Snapdragon 845. Ubuntu 18.10 introduces the GNOME 3.30 desktop and Yaru, the new community-developed default theme. Fingerprint unlock functionality is featured for compatible PCs and the latest versions of Firefox, LibreOffice, and Chromium are included.